A new paper is just out in which all the characters have been covered previously in this blog, but not as parts of a single story. It describes an interprets the relationship between the mysterious conulariids and trepostome bryozoans in the Katian and Sandbian (Upper Ordovician) of northern Estonia. The authors have all made appearance here, including lead author Olev Vinn (Institute of Ecology and Earth Sciences, University of Tartu, Estonia). Andrej Ernst (Institut für Geologie, Universität Hamburg, Germany), myself, and Ursula Toom (Institute of Geology, Tallinn University of Technology, Estonia). It was a fun team to work on, and Olev led it masterfully. 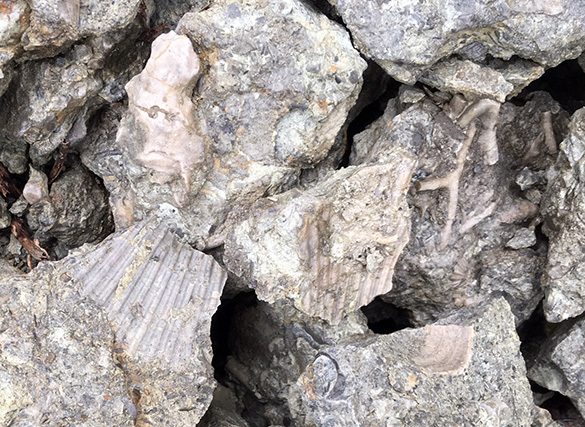 There are numerous trepostome bryozoans in the Upper Ordovician of Estonia that grew up and around the bases of conulariids, which are extinct cnidarians. This is, in fact, an example of bryoimmuration as covered in my last post. The puzzle is what was the relationship between these two groups. Were the conulariids parasites on the bryozoans? 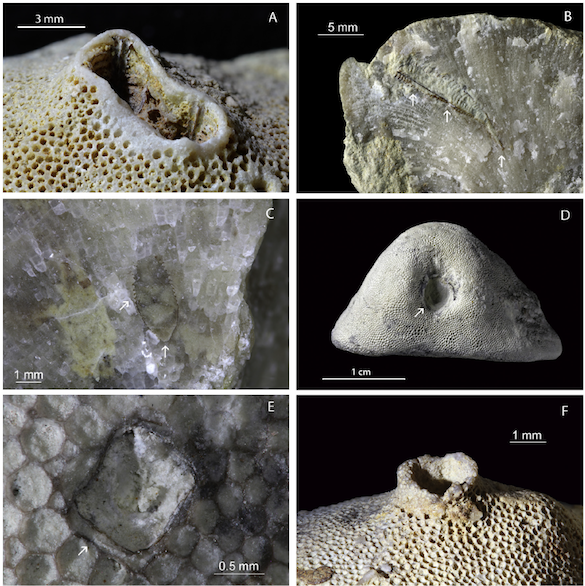 Did they gain protection from predators by embedment in the bryozoan calcitic skeleton? Were the bryozoans prime real estate for the conulariids because they were hard substrate islands on a muddy seafloor? We think the answers are probably yes to all these questions. The top composite of images is Figure 3 in the paper. The caption: A, Two conulariids Climacoconus bottnicus (Holm, 1893) in Diplotrypa bicornis (Eichwald, 1829) from Haljala Regional Stage, northern Estonia, note the slightly elevated apertures of conulariids (GIT 720-4). B, Longitudinal section of Diplotrypa abnormis (Modzalevskaya, 1953) with conulariid Climacoconus bottnicus (Holm, 1893) (GIT 537-1822) from Haljala Regional Stage, northern Estonia. C, Longitudinal section of completely embedded Climacoconus bottnicus (Holm, 1893) in Esthoniopora communis (GIT 537-1656) from Haljala Regional Stage, northern Estonia. D, Conulariid in Mesotrypa expressa Bassler, 1911 from Oandu Regional Stage, northern Estonia; note the depression around the conulariid’s aperture (GIT 770-7). E, Conulariid in Mesotrypa expressa Bassler, 1911 from Oandu regional Stage, northern Estonia; note the malformation of a zooid near the aperture of the conulariid (GIT 770-92). F, Conulariid in Esthoniopora subsphaerica from Rakvere Regional Stage, northern Estonia; note the strongly elevated aperture of the conulariid (GIT 537-1760). 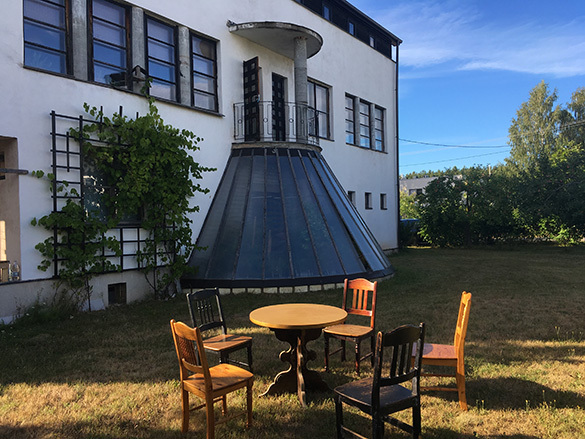 This work is another product of Wooster’s generous research leaves program that has supported many trips to Estonia. Vinn, O., Ernst, A., Wilson, M.A., and Toom, U. 2019. Symbiosis of conulariids with trepostome bryozoans in the Upper Ordovician of Estonia (Baltica). Palaeogeography, Palaeoclimatology, Palaeoecology 518: 89-96. I’m pleased to link to a new paper that has just appeared in the journal Lethaia. My wonderful coauthors are Caroline Buttler (National Museum Wales) and Paul Taylor (Natural History Museum, London). 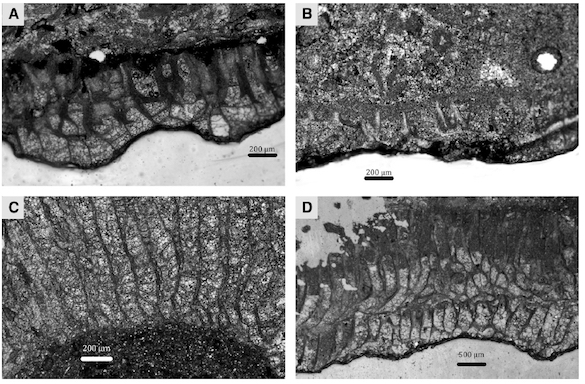 The paper explores the role calcitic bryozoans play in preserving molds of aragonitic shells, a process we call bryoimmuration. In the image above we have two views of a single specimen from the Cincinnatian (Upper Ordovician) of the Cincinnati, Ohio, region. It is a trepostome bryozoan that encrusted the exterior of a bivalve shell. The bivalve shell was aragonitic and thus dissolved away during diagenesis. The bryozoan skeleton is calcite, a mineral that does not dissolve as easily as its cousin aragonite. The surviving bryozoan skeleton thus preserved our only record of the now-dissolved bivalve shell. The larger concept of one group of organisms affecting the preservation of another we call taphonomic engineering. 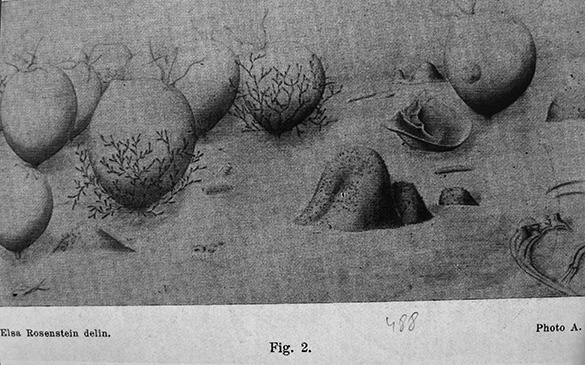 Below are cross-sections of these bryoimmuring bryozoans, with the original caption. Fig. 3. Acetate peels of bryoimmuring bryozoans cut perpendicular to basal growth surface (longitudinal); all from the Upper Whitewater Formation (Katian) near Richmond, Indiana (locality as in Fig. 2). A, heterotrypid bryozoan that grew across the ribs of an ambonychid bivalve. Note the thin zooecial walls in the early fast-growing stage, later thickening upwards (CW‐148‐92). B, very thin sheet of a trepostome bryozoan that encrusted an ambonychid bivalve (CW‐148‐93). This bryozoan did not develop an exozone and is thus impossible to identify. 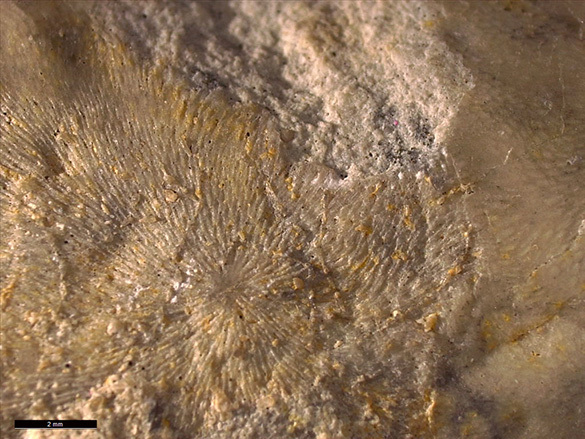 C, heterotrypid bryozoan that developed a thick exozone while growing on an ambonychid bivalve shell (CW‐148‐94). The shell later dissolved and sediment took its place. D, multilaminar growth of a heterotrypid bryozoan on an ambonychid bivalve (CW‐148‐95). The bryozoan colony overgrew itself. This research was supported by an award from the Henry Luce III Fund for Distinguished Scholarship at The College of Wooster. 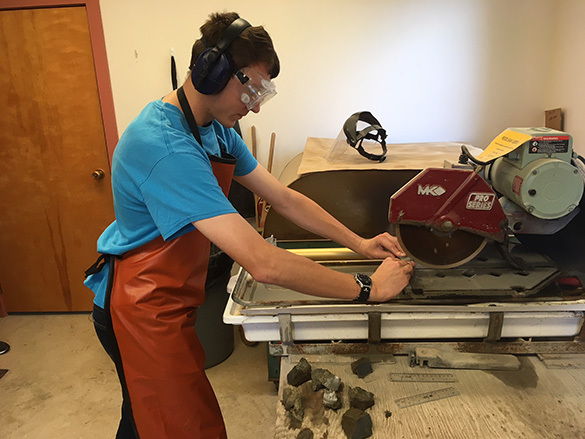 Nick Wiesenberg helped with the fieldwork. It was a fun project. 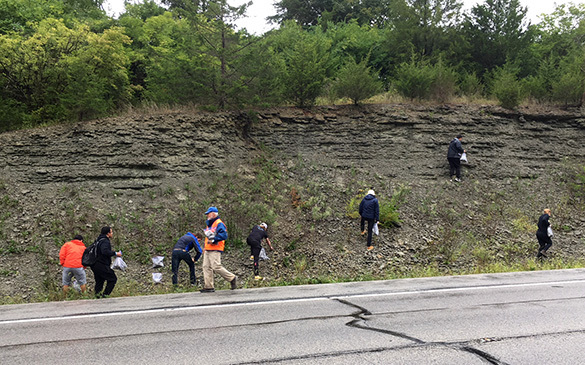 The Invertebrate Paleontology class at Wooster had its annual field trip today to the Upper Ordovician (Katian) Cincinnati Group (Upper Whitewater Formation) in eastern Indiana. The weather looked terrible as the remnant of Tropical Storm Gordon worked its way into the Great Lakes region. Three to five inches of rain were forecast for our field area just south of Richmond, Indiana (locality C/W-148). For all I know, that massive amount of rain actually fell today — but not while we were there! As you can see above, we collected treasures in the dry. 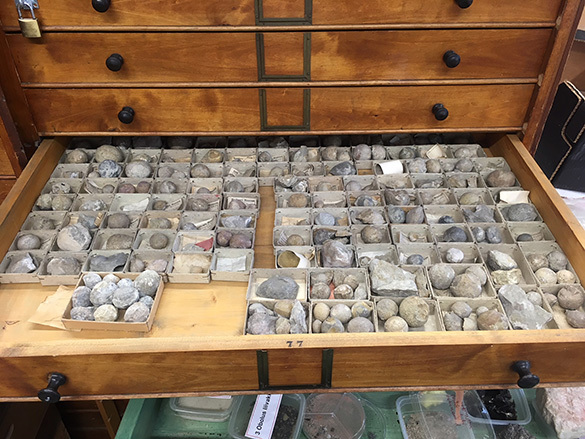 In fact, the specimens were nicely washed for us, with the fossils standing out better than I’ve ever seen. Here’s a random image of the rubbly limestone we examined. Count the bryoimmurations! 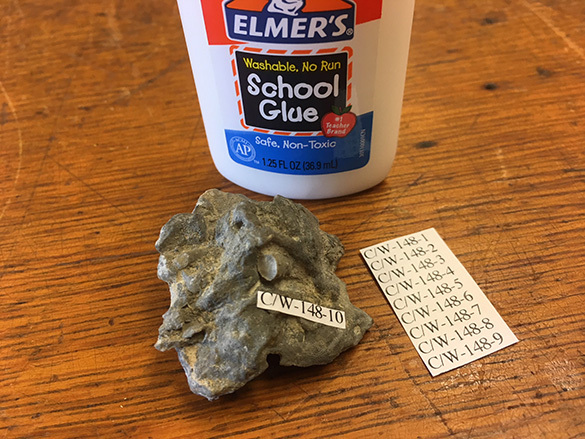 This is perfect material for beginning paleontology students. Each one made a representative collection to clean, prepare and interpret in our cozy Wooster lab the rest of the semester. We’ve certainly had better weather here in past years, but I’m not complaining about today. We slipped by a ghost. 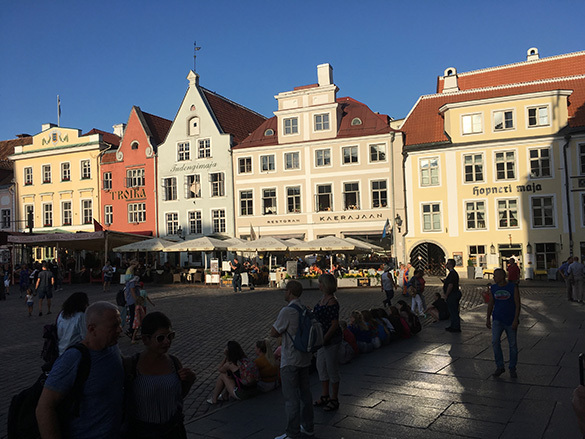 Tallinn, Estonia — This morning Bill Ausich (Ohio State University) took the bus from Tartu to Tallinn to finish one more research task and then prepare for the long journey home. 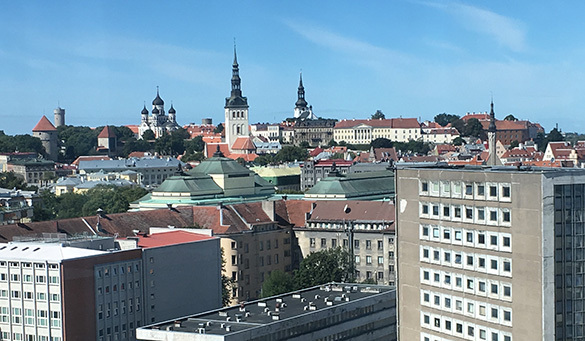 Above is the view from my hotel room towards the Old City section of Tallinn. 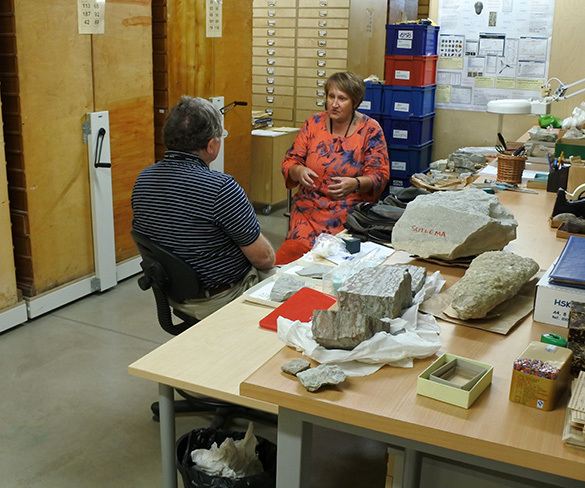 After getting settled, we visited Ursula Toom at the Department of Geology, Tallinn University of Technology. 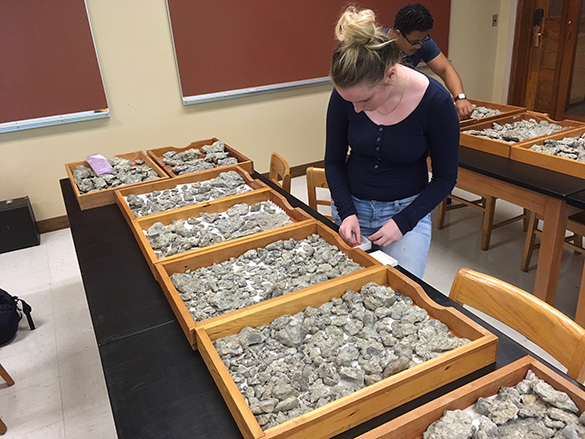 She and Bill (above) exchanged crinoids, and then Ursula discussed with me a wide variety of Ordovician borings as part of her dissertation work. This is a small part of the various mystery specimens Ursula shared with me. There are some fantastic undescribed borings in this lot. Afterwards Bill and I had an early evening dinner in the Old City, beautiful in the setting sun. Our research in Estonia is done! Tomorrow we pack up and then walk around Tallinn taking in the sights and culture. On Friday we fly home. I hope to describe the results of our work soon in this blog. Tartu, Estonia — Bill Ausich and I started our last full day in this city at the University of Tartu Natural History Museum, finishing our work with the marvelous Mare Isakar, pictured above. Mare quickly found the specimens we needed, and many others she knew we would find interesting. She did nearly instant registration of specimens, greatly speeding up our taxonomic progress. 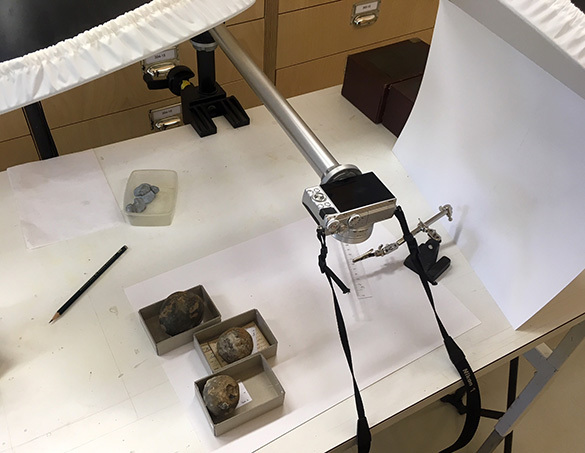 We finished photographing museum specimens for our future reference and possible publications. 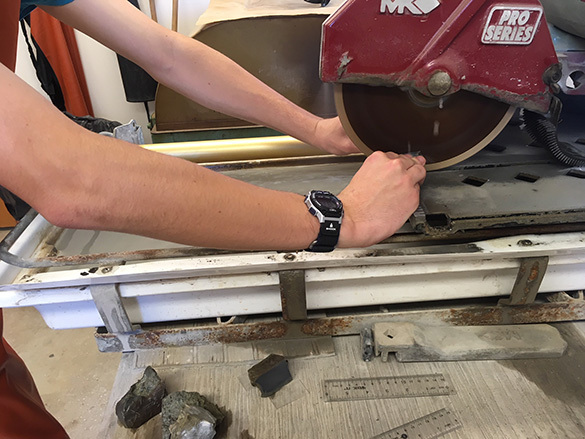 Bill concentrated on Silurian crinoids and I worked on the Ordovician rhombiferan Echinosphaerites. 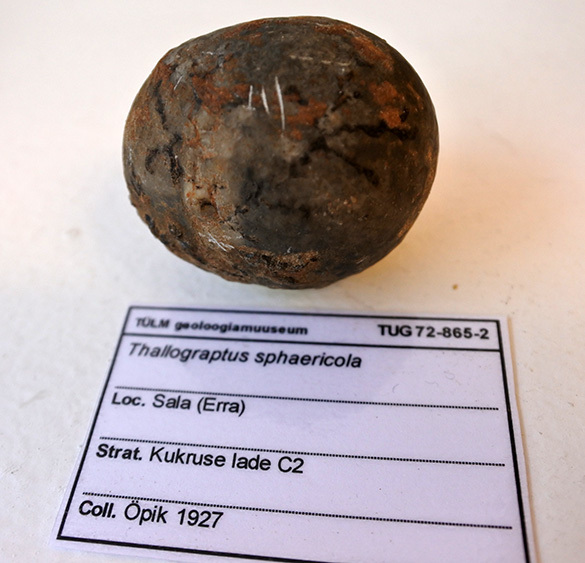 This is one of Öpik’s Echinosphaerites aurantium specimens. Two roundish encrusting brachiopods are visible, along with sheet-like bryozoans. 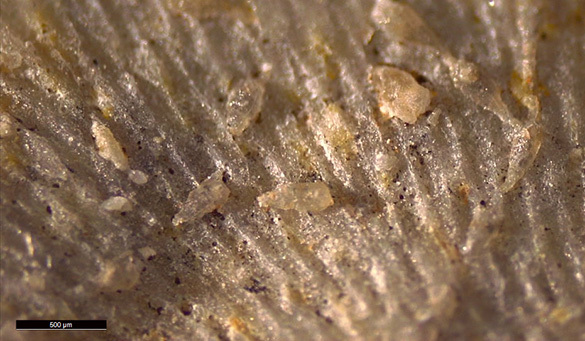 Shockingly, there are gouges in the bryozoans as if someone tried to scrape them off! 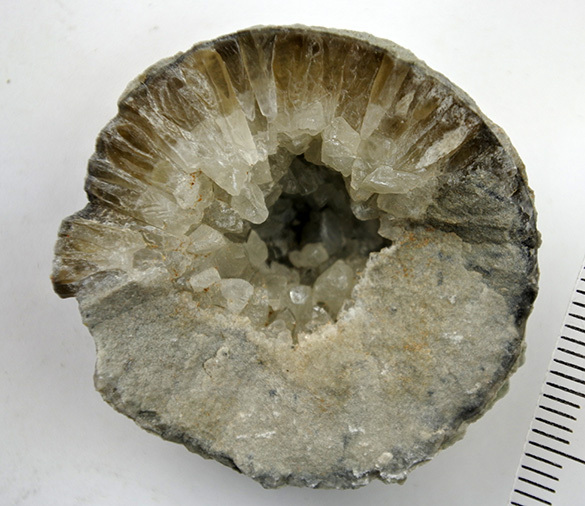 Most of the rhombiferans are filled with sediment and/or calcite crystals, but Bill found this hollow one in the collections. Note that it was still able to resist sedimentary compaction. Also note the bryozoans on the broken edge. This broken specimen shows sediment in the bottom of the skeleton and crystals in the top half. This is known as a geopetal structure where the sediment shows what was the lower part of the skeleton when it was filled. Here’s another example. Mare found even more specimens of Echinosphaerites today, so there is much to do on a later trip! Thank you again to Mare Isakar and our other friends in Tartu. Tomorrow we travel to Tallinn for a bit more work before heading home on Friday. 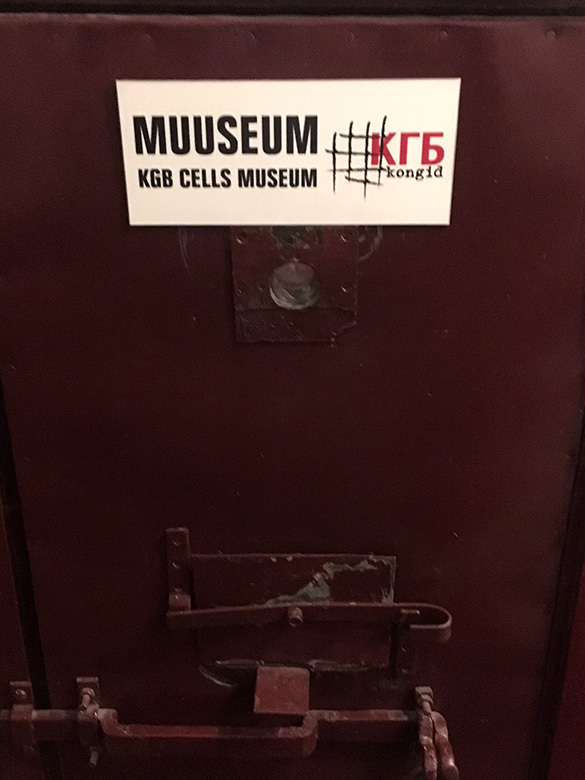 And now for something darker — the KGB Cells Museum in Tartu. It is a horrifying place of pain, anguish and hopelessness, yet today is surrounded by a vibrant, free city and country. 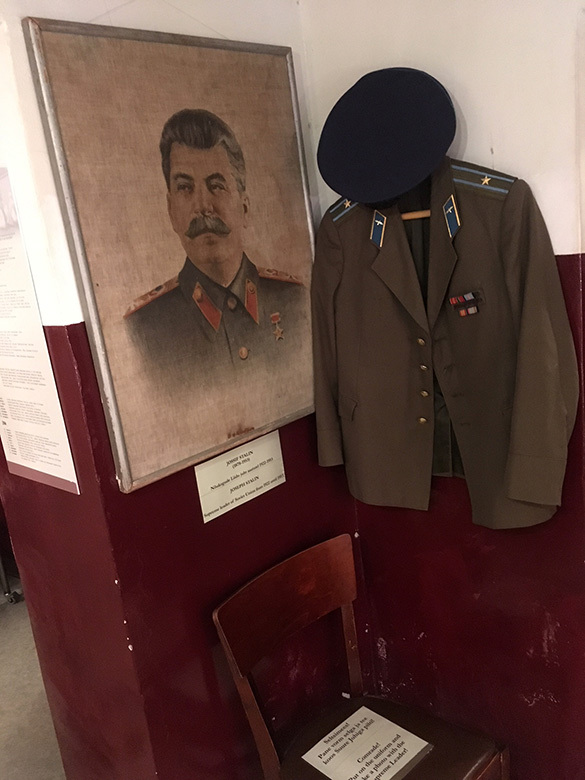 This museum, in an actual KGB prison, is both disturbing and ultimately inspiring. It is a history we avoid at our peril. A cell door near the entrance to this basement complex of “the grey house”. 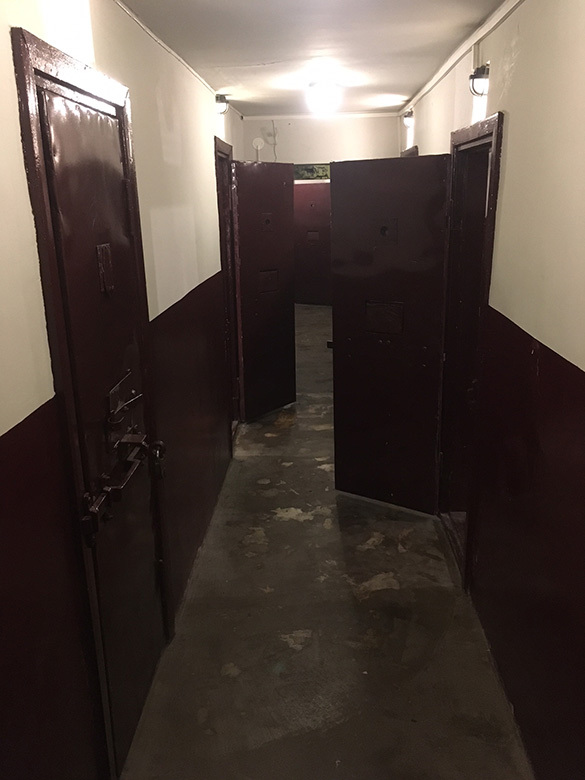 These dungeons were used by the Soviet secret police for detention, torture and executions in the 1940s and 1950s. For a brief interval (1941-1944) the Nazis took over and did the same beastly activities. The victims were almost entirely Estonians. A hallway of cells. The exhibits inside the rooms include many Soviet artifacts, along with stories of Estonian resistance. 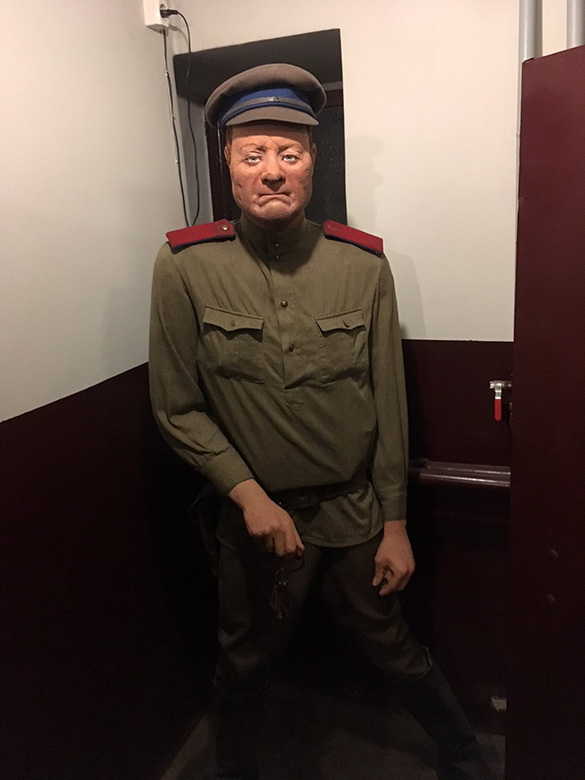 A KGB mannikin at the end of a hallway. A sound track of a harsh Russian voice plays in a loop here, along with inevitable screams and moans. The brutality of the place is quite evident enough, thank you. Finally, before you leave, why not dress up as a Soviet KGB officer and pose with Stalin? I don’t understand why anyone would do such a thing, especially in such a tragic space. Tomorrow it is back to science as Bill and I take the bus to Tallinn. The countryside of free Estonia is beautiful. 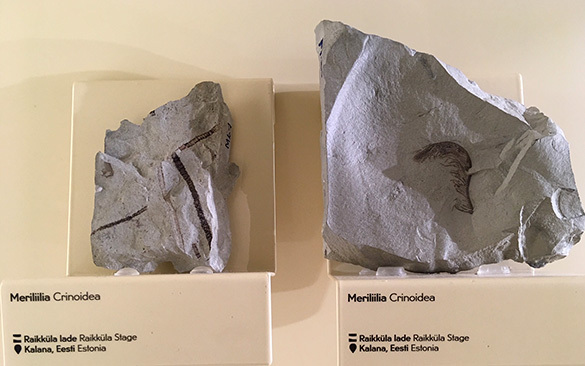 Tartu, Estonia — As a sign we’re near the end of our work in Tartu, there are no crinoids in this post. 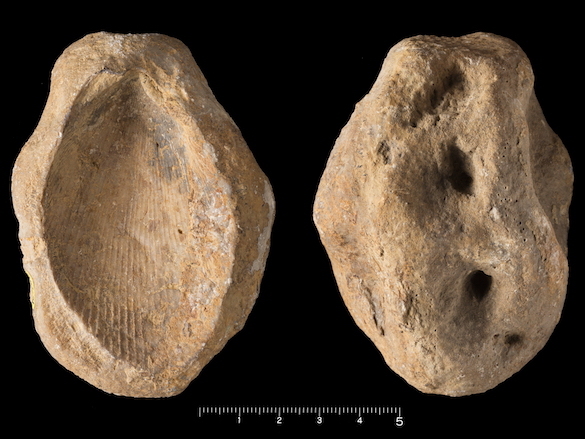 Instead, above is an Ordovician bryozoan from Estonia that encrusted the aragonitic shell of a nautiloid. The aragonite dissolved away, giving my favorite underside view of a bryozoan attachment from its ancestrula. We’ve seen this more than once in this blog. The bonus here are the just-visible chains of little crystalline teardrops across the surface. These are the zooids of the cyclostome bryozoan Corynotrypa. 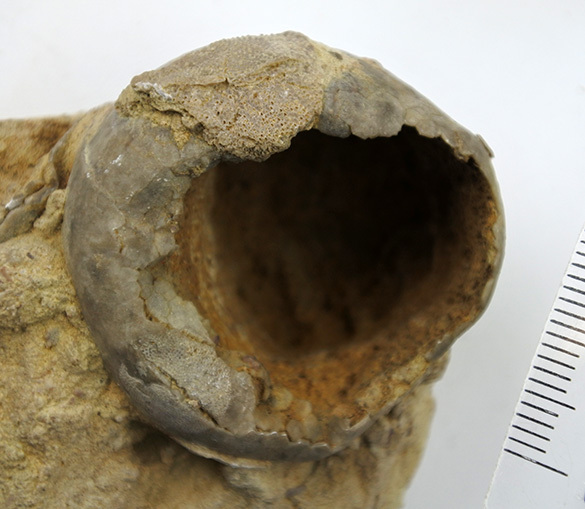 They are encrusted right-side-up, meaning that they grew across the exposed attachment surface of the big bryozoan. The nautiloid shell thus dissolved between the two encrusting events — very early on the seafloor. Classic calcite sea dynamics. 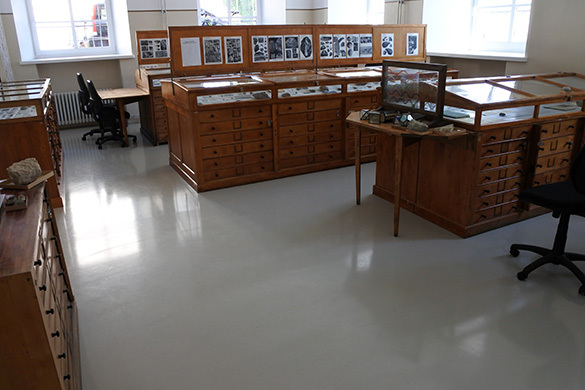 After sorting out the specimens used in our crinoid studies, and doing some last microphotography, we finished our work for this season at the University of Tartu Department of Geology. A small and happy garden party followed. Bill Ausich and some of our Estonian colleagues and friends. 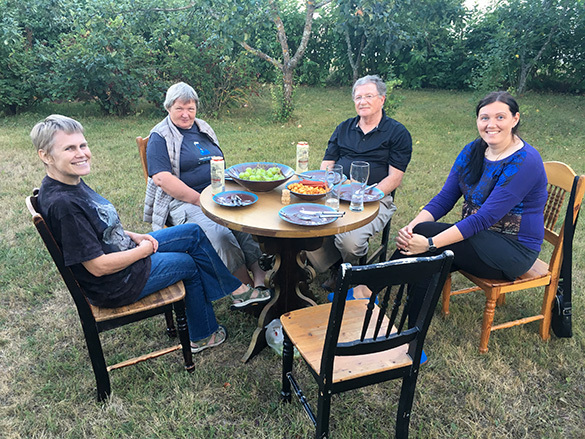 From the left is Oive Tinn, Mare Isakar, Bill, and Viirika Mastik. Great conversations. It actually got a little chilly outside, so we ended in Oive’s house (see below). 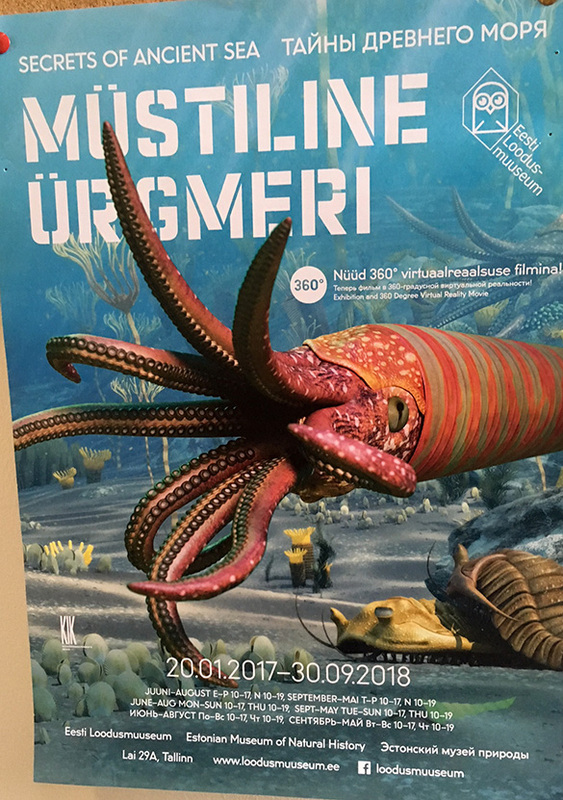 Tartu, Estonia — Bill Ausich and I returned to the Natural History Museum today to tour the public exhibits. It was hard to not make it into a study trip, though, for our research. I suppose since our “work” is so enjoyable it is difficult to separate it from a holiday. 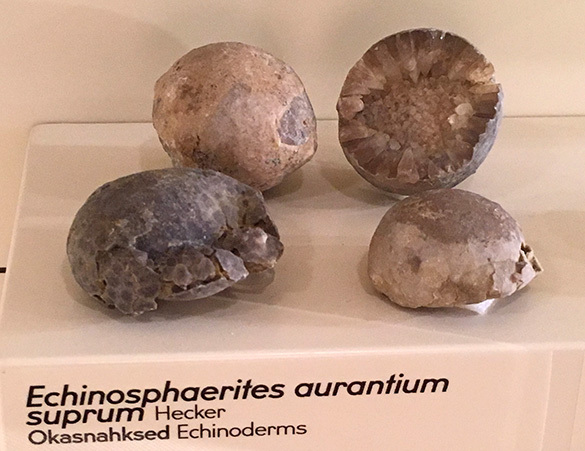 Above, for example, is a display of our favorite rhombiferan, Echinosphaerites aurantium of the Estonian Upper Ordovician. There is a display about the Kalana Lagerstätte that we are studying. 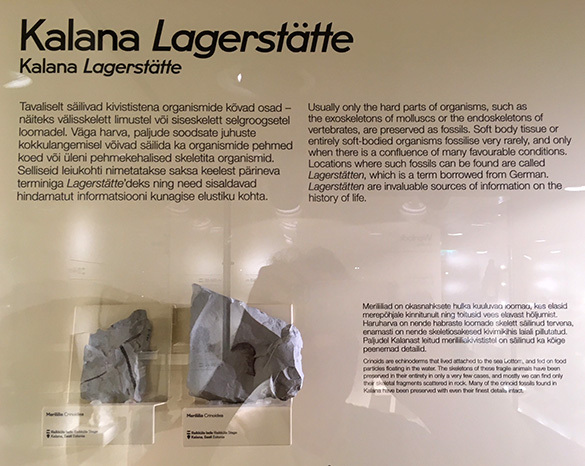 Here is the museum description of the Lagerstätte. And a close-up of some crinoids (“meriliilia”, sea lilies) from the Kalana. It is a fun museum with a very thorough geology section, including meteorites you can touch (a favorite of mine). It has what is now an old-fashioned style of emphasizing actual specimens that Bill and I appreciated. There is a large biology section with much taxidermy and mounted skeletons. 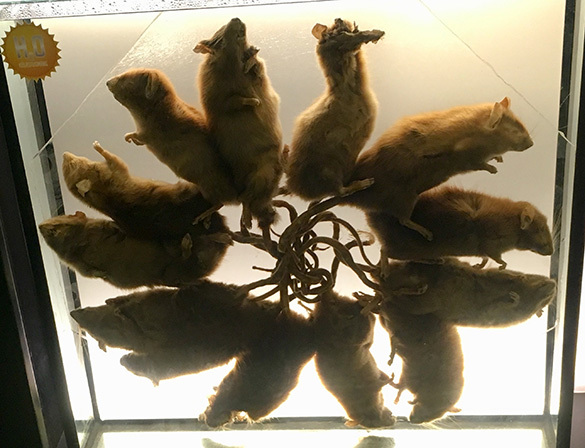 One of the featured exhibits is a rare “rat king” (see below), which you must look up! 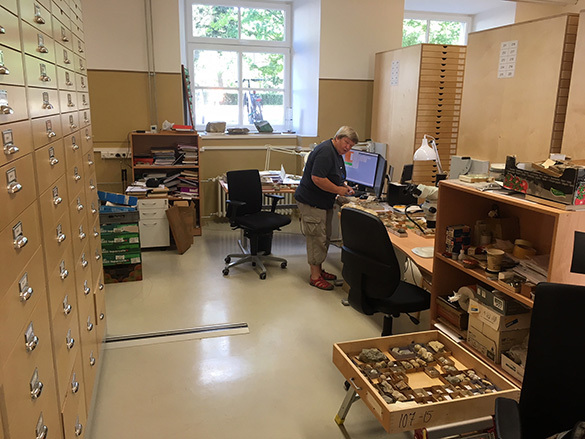 Tartu, Estonia — Today Bill Ausich and I began our work in the University of Tartu Natural History Museum. Our most knowledgeable and helpful host is chief geology curator Mare Isakar. 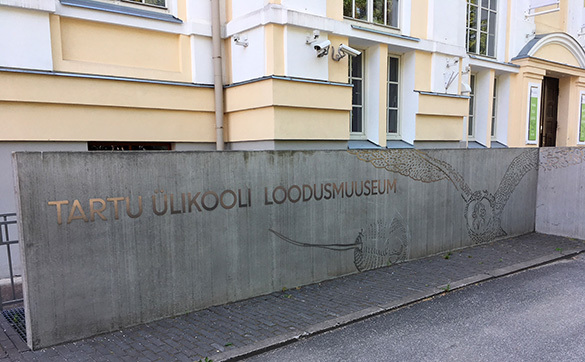 This museum is just a short walk from our hotel. 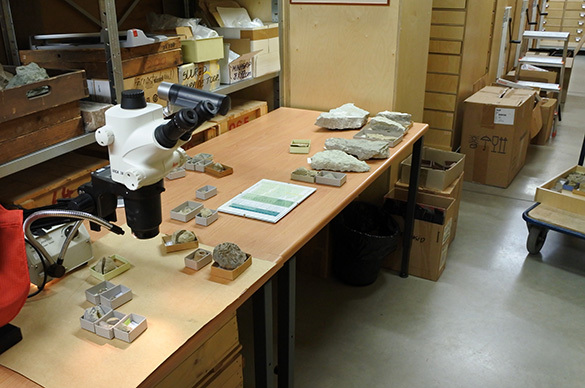 This is one of the collections rooms in the paleontological research part of the museum. 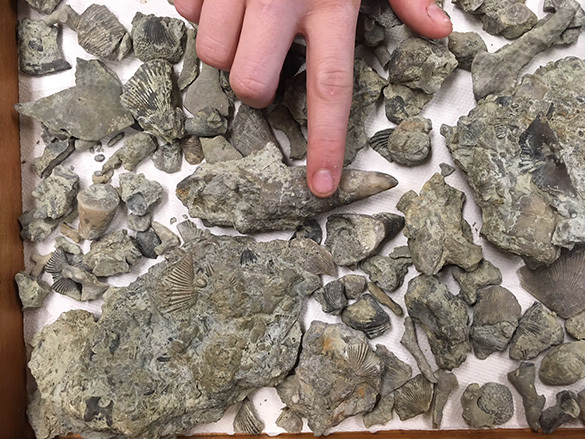 Here is where I examined Ordovician bivalves and gastropods for bryoimmurations. 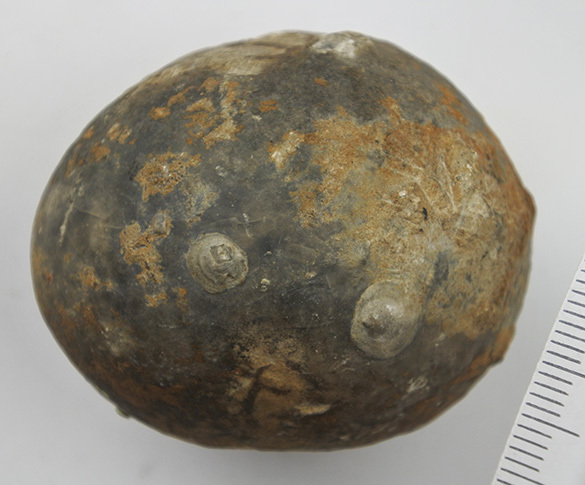 One of our goals is to study encrusters on specimens of the nearly spherical Late Ordovician rhombiferan echinoderm Echinosphaerites aurantium. Mare Isakar kindly set out dozens of specimens for us to study, a small subset of which is shown above. 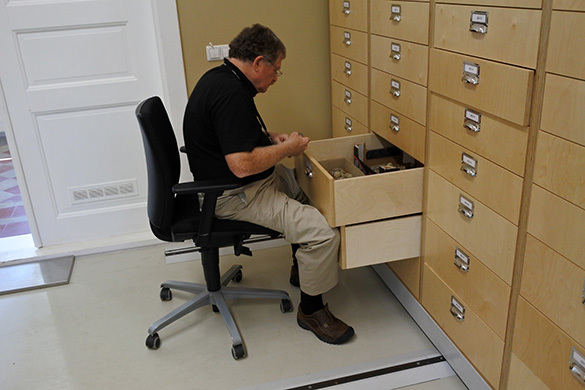 Here is Bill at work scanning through a drawer of Echinosphaerites. One of the encrusted Echinosphaerites skeletons. The black, branching, carbonaceous encruster is the graptolite Thallograptus sphaericola (“sphere-dweller”). Posted in the museum is this figure by Öpik (1925) showing his idea of an Echinosphaerites community with encrusting graptolites. We want to test his hypothesis that the graptolites encrusted living rhombiferans as shown. My hypothesis is that the graptolites lived instead on dead, cemented skeletons. Armin Aleksander Öpik (1898-1983) was a prominent and productive Estonian paleontologist. Like many Estonian scientists of his generation, his career was bifurcated by World War II. Several characters from Estonia’s scientific past watched us work. 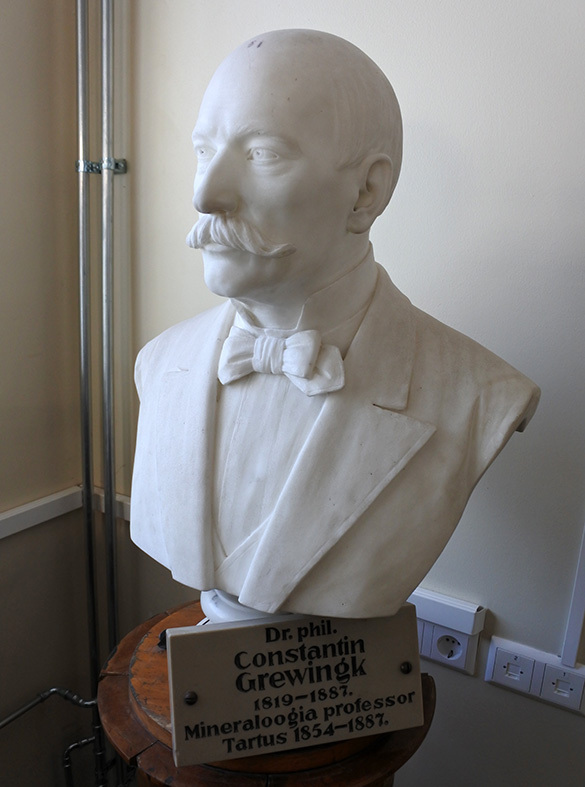 This is Constantin Grewingk (1819-1887). 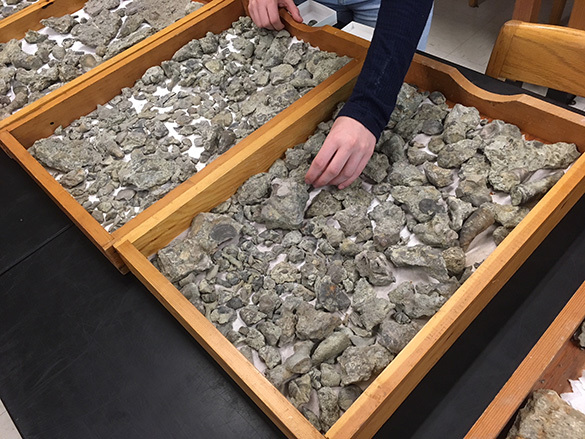 Ohio paleontologists will recognize him as the namesake of the rugose coral Grewingkia. 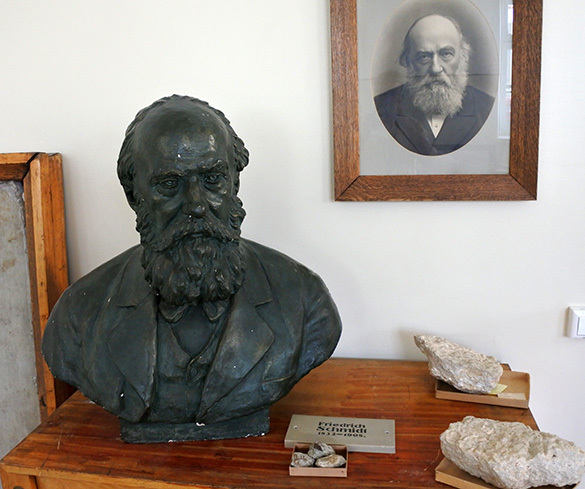 Here is Friedrich Schmidt (132-1908), considered the founder of Estonian geology. Both Grewingk and Schmidt were Baltic Germans. 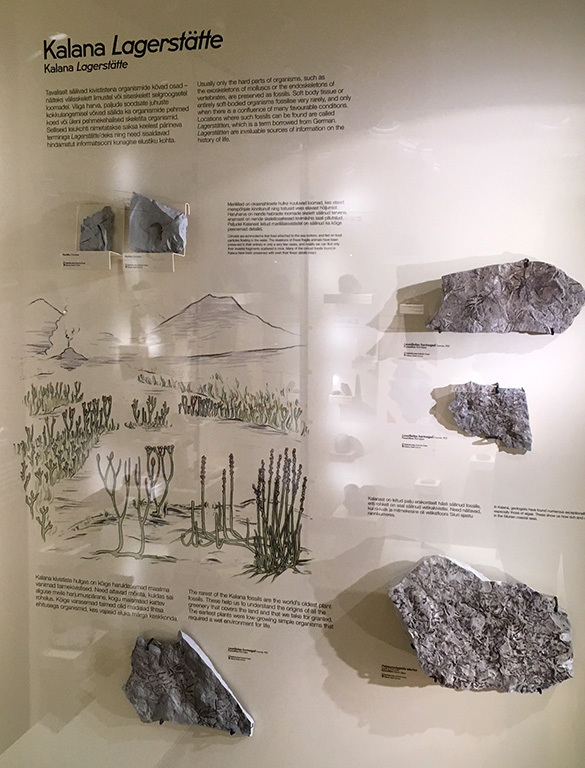 The public part of the museum includes this exhibit on “Secrets of Ancient Sea”. You may recognize some familiar Ordovician characters in this scene. Bill and I intend to visit the public exhibits here on Sunday. Thank you again to Mare Isakar for setting us up so efficiently for our research! 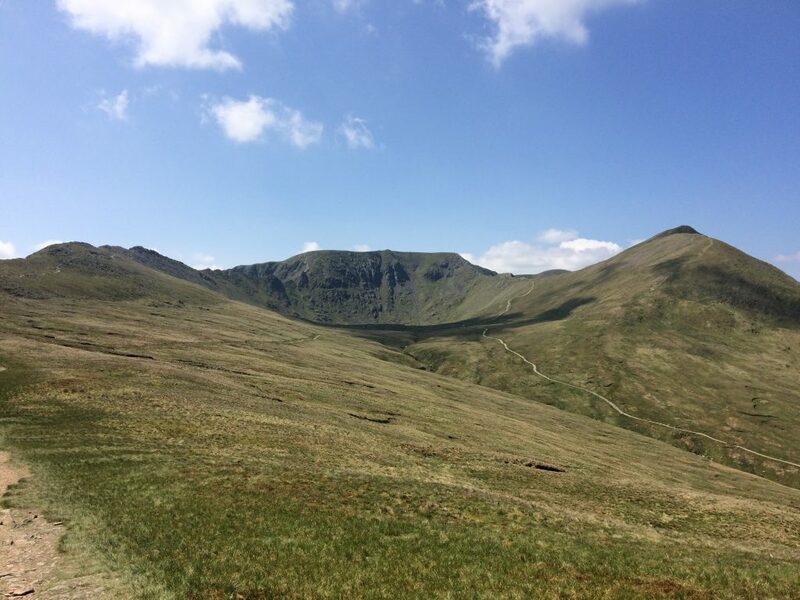 The black mountain icon indicates the location of Helvellyn in the Lake District. 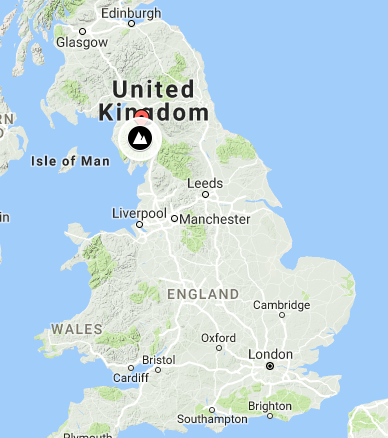 During the last two weeks of May, Dr. Alley and were in the UK. Part of the experience involved complaining about the inadequate width of UK roads, but there was also some undeniably beautiful geology. 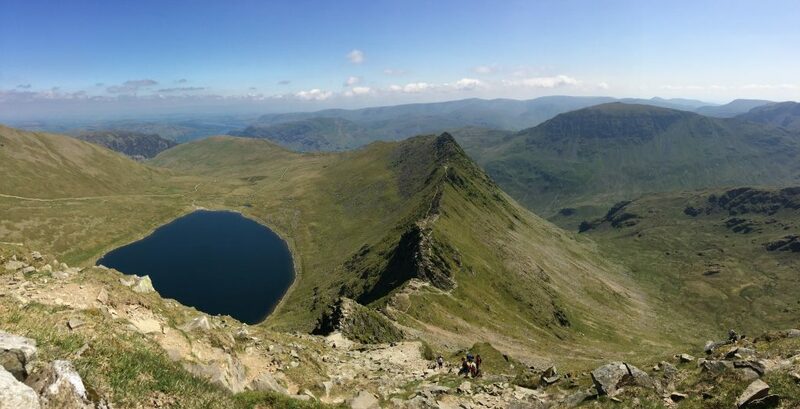 One such location was Helvellyn, in the Lake District of England. This is one of the “top walks” in the UK, but note that the term “walk” has a very loose definition in British English. 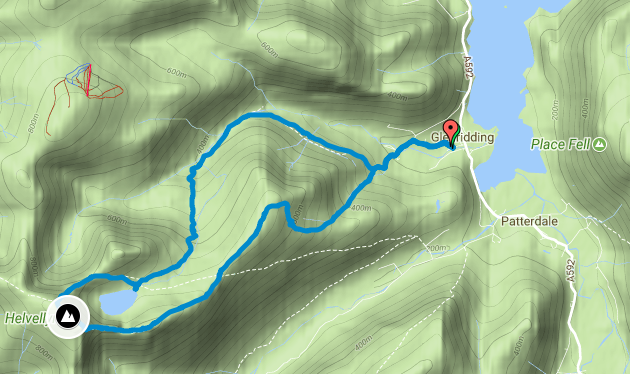 Really, this is a hike, with a climb of nearly 3000 ft in about 4 mi. If you’re a fan of glacially carved, open landscapes, it deserves the hype. The exposed rocks of the Helvellyn Range are part of the Borrowdale Volcanic Group. The volcanics here transitioned from primarily intermediate lava flows (andesite) to more silica-rich magma that resulted in pyroclastic flows and ignimbrite deposits. This all occurred around 450 million years ago (Ordovician) — around the same time as the Taconic Orogeny in North America (most notably in New England). That’s the raw material for the terrain, but the carving is much more recent. Glaciers from the last glacial advance have gouged out the sides of these mountains into deep u-shaped troughs with steep sides and wide bottoms. 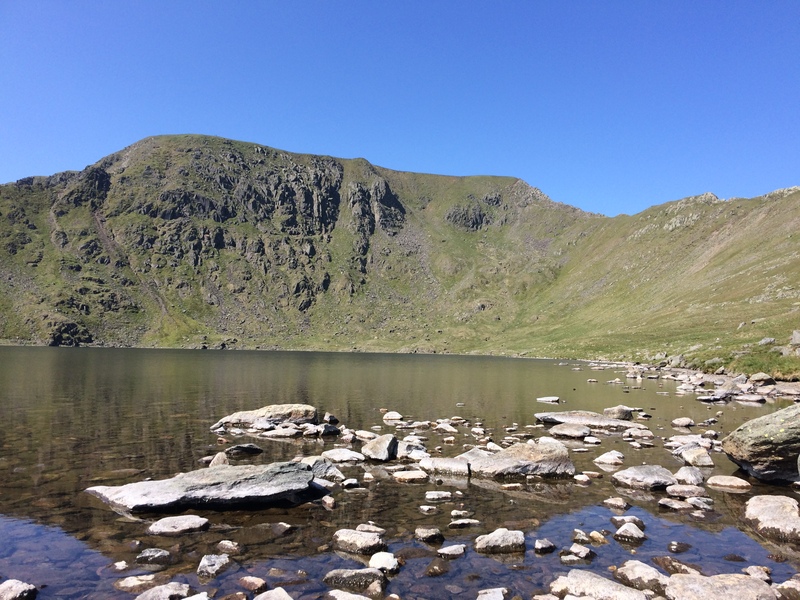 Below Helvellyn sits a deep bowl called a cirque. This is where a large mountain glacier once originated, digging out a hole from which it later advanced. Look back at Helvellyn Cirque from Birkhouse Moor. If you go up into the cirque today, that depression has been filled with a small lake called a tarn. Tarns sits at the headwaters of watersheds, and the outlets are often some of the cleaner water you can find (although they may be turbid from lots of sediment). This tarn, though, had a large number of sheep around it. So I’d be a little more suspicious. Actually, the sheep are a more important aspect the the geology than you might think. Looking down from Helvellyn, you can see the “Striding Edge”. This is an arête, a sharp ridge that, thousands of years ago, was the boundary between two parallel glaciers. The glaciers would have been flowing away from you in the image below. View eastward from Helvellyn overlooking Striding Edge (an arête) and Red Tarn. 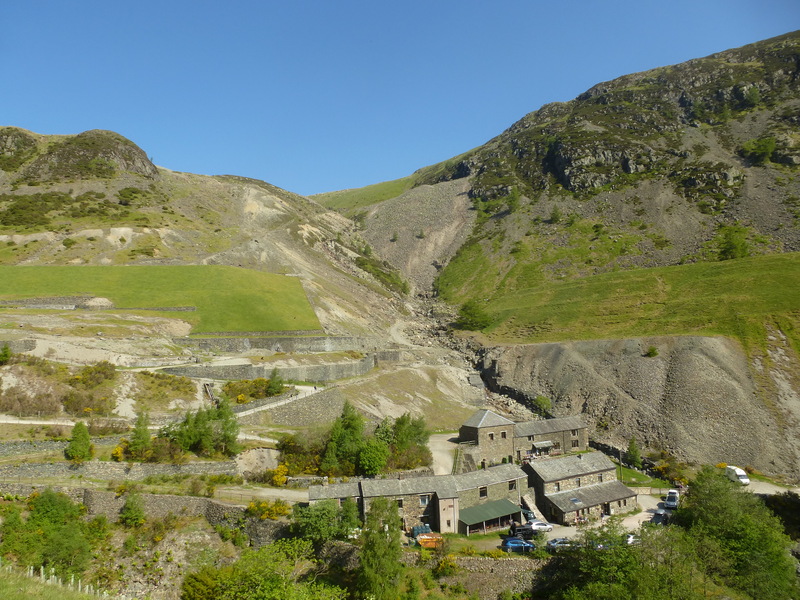 Finally, when walking along the northwest side of the mountain, you go by the Greenside Mine. In the 19th century, veins along a normal fault through the mountain were mined for the mineral galena (PbS), which also contains impurities of silver.